Our journey started and ended in Khon Kaen (Thailand). 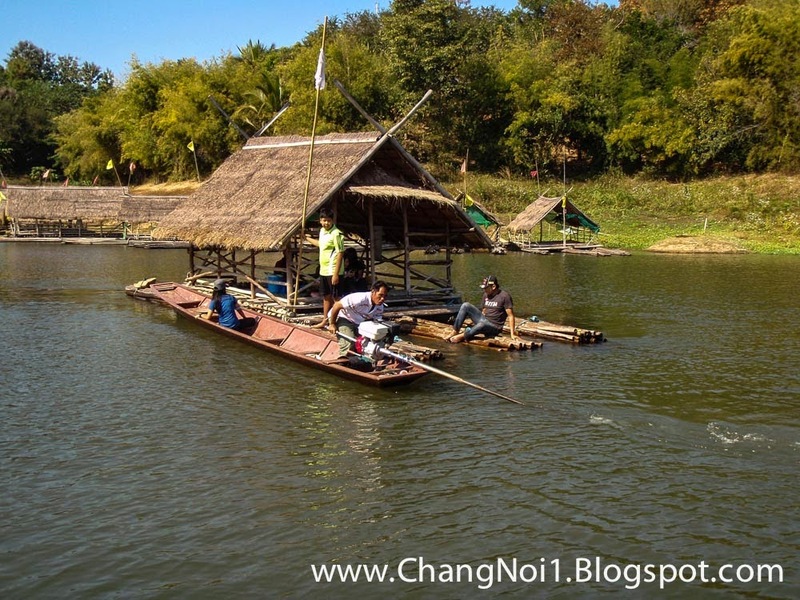 First two days exploring Khon Kaen City and nearby area like Sight seeing at Phu Hin Chan Si. 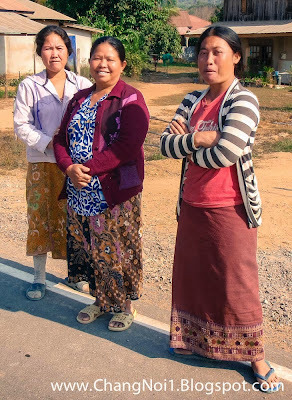 After that we did drive to Nong Khai (Thailand) where we would cross the Thai-Lao Friendship Bridge to Vientiane. It is easy & straight forward but is takes some time. We had to apply for a Lao Visa (35us$) and arrange the temporarily export / import of our car. So we arrived in the afternoon at Mandala Boutique Hotel. 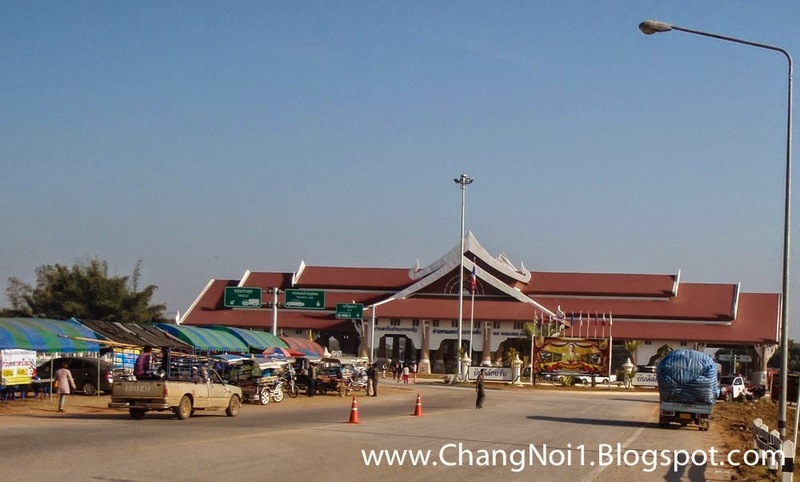 When you would like to fly from Bangkok to Vientiane it might be much cheaper to fly with Nok Air from Bangkok (Don Muang) to Udon Thani and use the "Fly & Ride" service from Nok Air between Udon Thani and Vientiane. We did stay 3 nights in Vientiane and would spend New Year here. 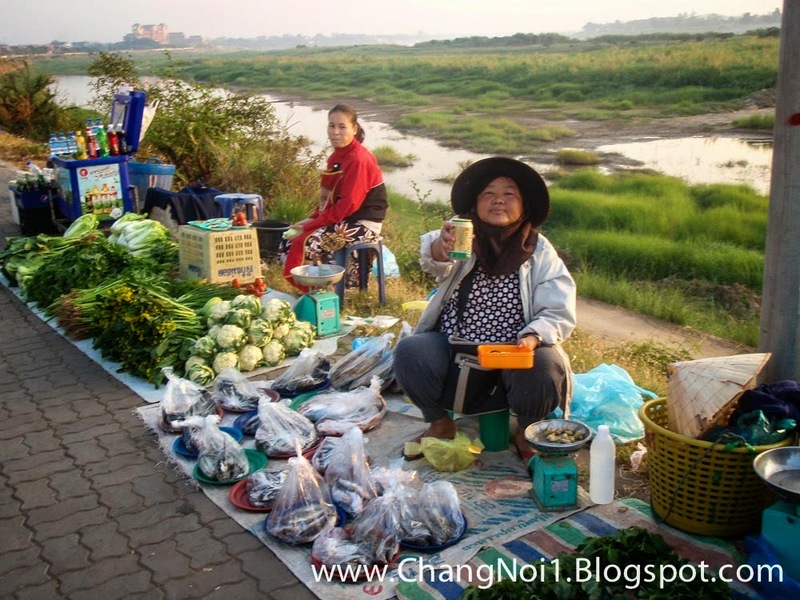 The evenings we did spend at the boulevard along the Mekong River. The new park along the Mekong River at the east-side (or is that south side?) is a great place to relax in the late afternoon and then just stroll your way up and enjoy a beautiful sunset. Then just after sunset settle down at the small restaurants at the east side (or would that be north side?) for food & Beer Lao. 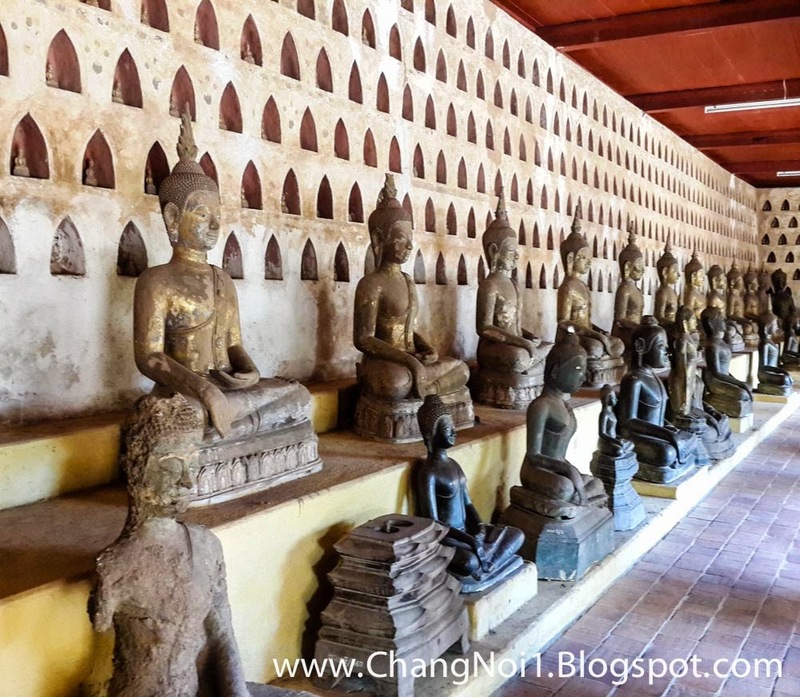 In the day time we did visit the famous highlights of Vientiane like the Vat Sisaket temple (my favourite). Another afternoon I just started walking and tried to get lost in Vientiane. In Vientiane we did eat at a few places and also at 2 old hands of restaurants what was a bit of a disappointment. After 3 days Vientiane it was time to start our tour along the Mekong River. 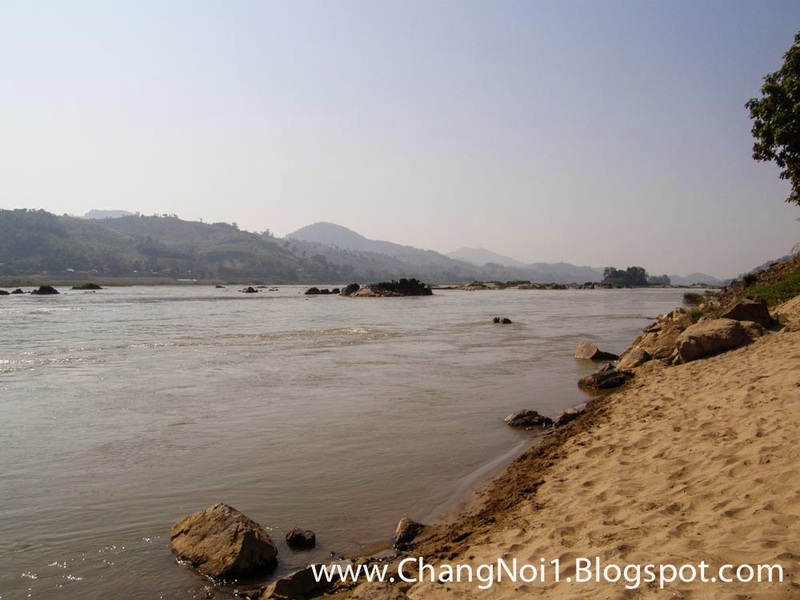 We first did follow the Mekong River until Xanakham. 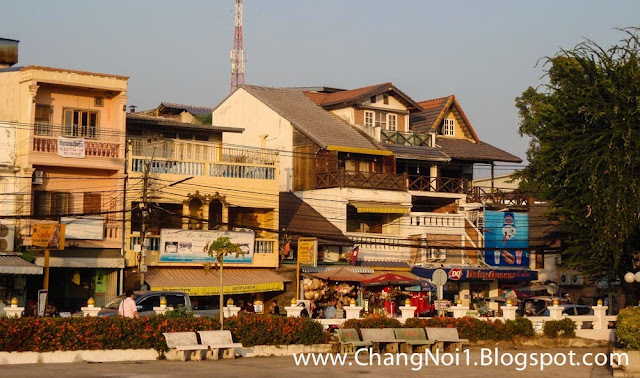 That is a small village along the Mekong River, opposite of Chang Khan (Thailand). Here is also a local ferry for border crossing, but for locals only. 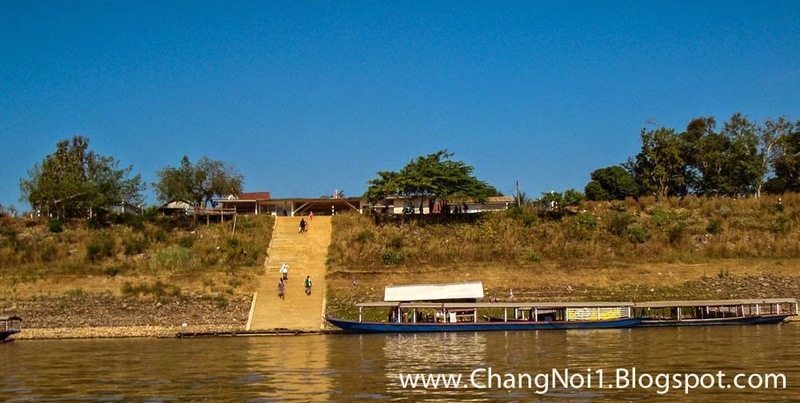 This is more or less also the point where the Mekong River begins / ends to be a border-river between Thailand and Laos. 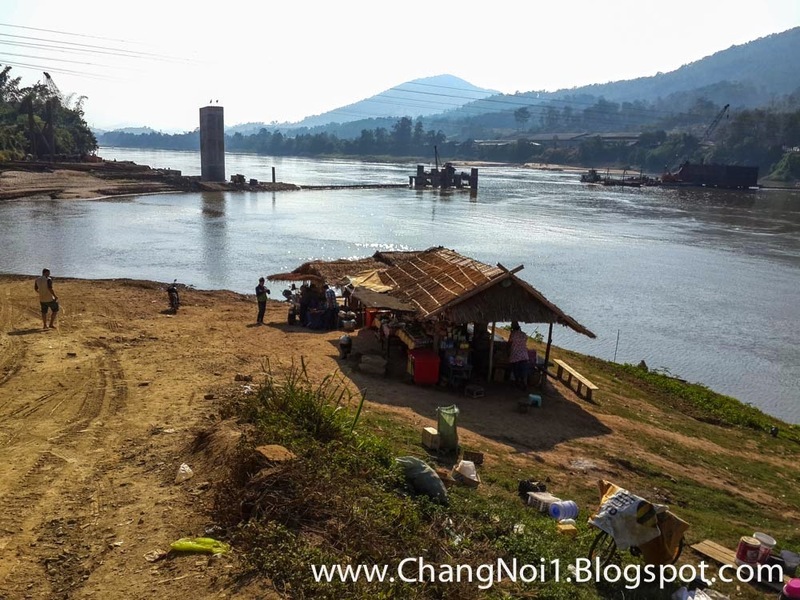 About 20 km after Xanakham the Mekong River goes into Lao territory (although a long time ago the river was also here a border-river between Thailand and Laos). 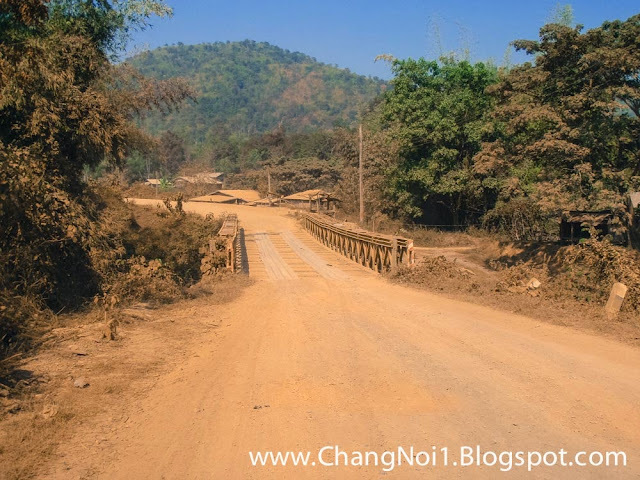 From Xanakham we headed a bit north and thru a beautiful mountainous area to be crossing the Mekong River to get to the small town of Pak Lay. We did cross the river by ferry, but I assume that within a year the bridge will be finished and the romantic ferry crossing will be history. We did stay for one night in Pak Lay at Thavyphet Guesthouse. There is not much more to do as relax, enjoy the sunset and have a Beer Lao and some food. So that is what we did. The next day in a early foggy morning we left Pak Lay to go to the border-crossing with Thailand at Thali. In this time of the year the Mekong River creates a lot of fog and the all area is filled with fog. After crossing back to Thailand we headed in direction of Loei city to have a lunch at a bamboo raft on a small lake in the mountains. As it was the week of New Year it was a bit busy. Again here is not much more to do as relax, eat & drink and maybe take a swim. And that is again exactly what we did. After our late lunch we did go to Loei city where we did stay at King Hotel. Loei city is a lovely provincial town and in the very late afternoon we headed out for a walk in the park, watch people and enjoy the sunset over Loei city. 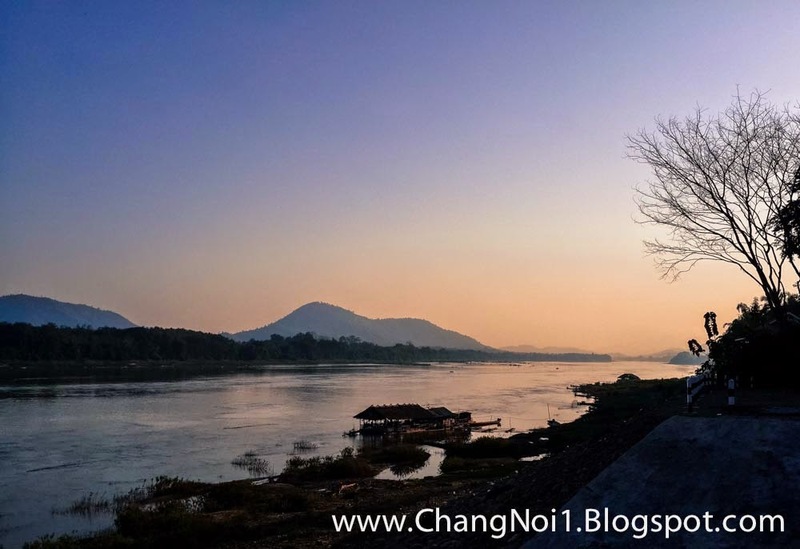 The next day we headed back to the mighty Mekong River to see the place where the Mekong River enters Thailand again as border-river. Here is a small mountain from where you have a beautiful view over the river. 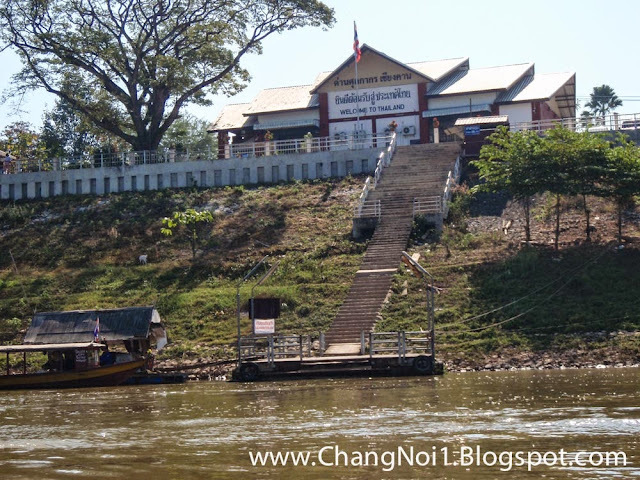 As it was very busy in Chiang Khan we skipped it and we did go to "Kaeng Khut Ku", what is a sharp bend in the Mekong River with rapids in the river. From here we made a 1 hour boat trip over the Mekong River to see Xanakham and Chiang Khan from the river. After 5 days of traveling it was time for our last destination ... Udon Thani city. It is a bigger provincial city with almost all the joy of Bangkok minus the traffic and air-pollution. Here we did stay at The Ozone Boutique Hotel. We enjoyed the evening with good food & drinks. 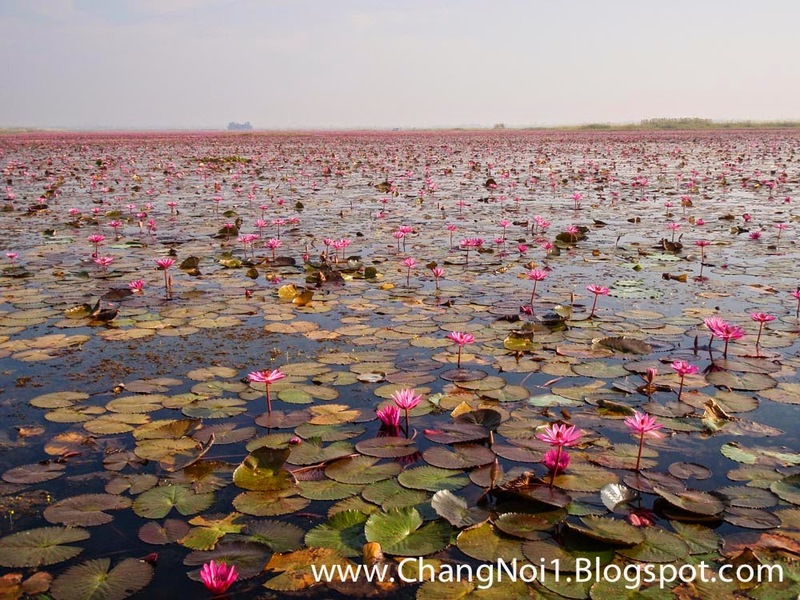 The last day we traveled back to Khon Kaen and on the way back we did visit A Sea of red Lotus Flowers. About the conditions of the roads that we traveled have a look at Road Conditions Laos.